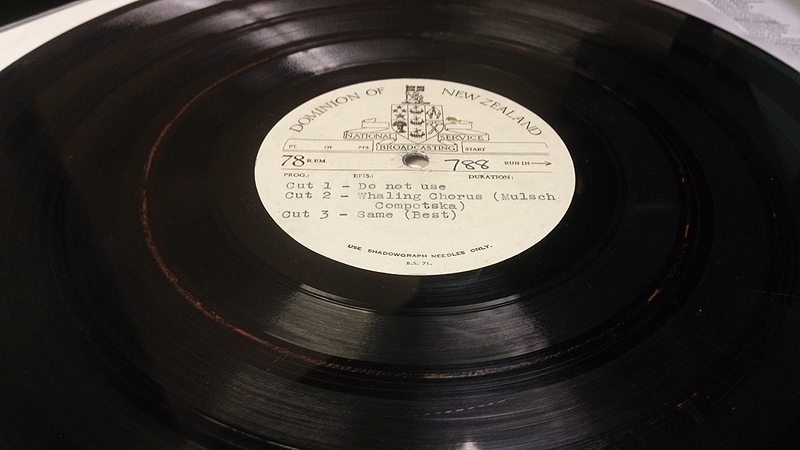 Ngā Taonga Sound & Vision audio conservator Sandy Ditchburn has found that local knowledge and a great phone technique can be handy tools when researching archival sound recordings. This week however, I had to branch out a bit further. I had come across a disc with the title, “R.S.A. 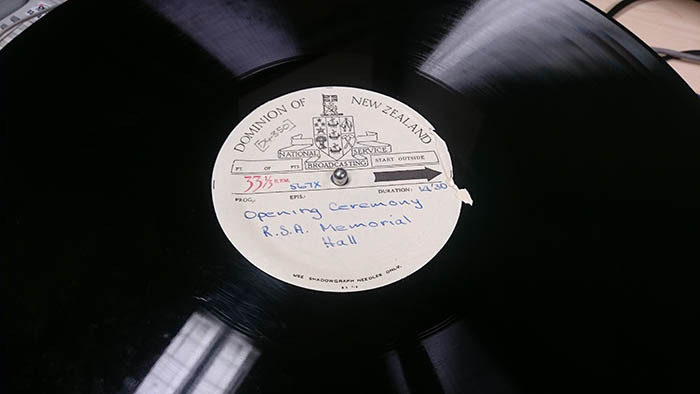 Memorial Hall Opening Ceremony.” I ascertained from the recording that this Memorial Hall was located in Invercargill, and, other than the names of a few speakers, that was the extent of the information given. I knew that having a date for this event would be extremely helpful in terms of information to put into our database, so set about searching for one. I found the number for the Invercargill R.S.A. but an unhelpful voicemail message explained that they were only open on Tuesdays from 1:30 to 4pm – not ideal on a Wednesday afternoon. My next call was made to the Invercargill City Council – another dead end, although the woman there did suggest that she walk past the building on her way to work the next morning and look for a plaque. Looking at the stack of discs still waiting to be preserved, I was eager to track down a date as soon as possible and this is where my local knowledge came in to play. If there was a plaque on the side of the building it would most likely contain the building’s date on it. I had walked past this memorial hall many times and remembered there being a free health service (Number 10) in an attached building. I even had their number stored on my phone from my poor student days! The very confused receptionist at Number 10 assured me that she wasn’t allowed to abandon her post to search for a plaque. Feeling like defeat was near, I wandered into our main office and explained my situation. After explaining the building’s location, and a quick search of Google Street View, we were looking at the R.S.A. Memorial hall on my colleague Camilla’s computer monitor. My other colleague Sarah then pointed out a grainy, black square on the side of the building next to the front door, that was most certainly a plaque. Google Maps street view, showing the location of the plaque. The closest manned building to that plaque (other than Number 10) was the H&J’s Flooring Xtra store, on the opposite side of the road. A moment later I was speaking to one of their flooring specialists, and asking if she would do me a favour by nipping across the road and taking a note of what the plaque said. She hesitantly agreed and, after taking my information, hung up. 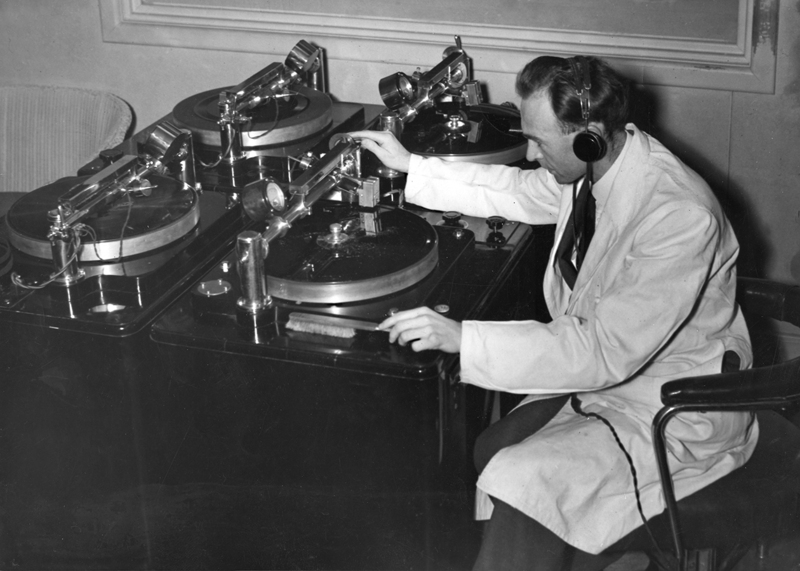 My phone rang after 10 minutes and I had my answer – the building was opened by Governor General, Sir Willoughby Norrie, on the 13th of March 1956. I explained to the woman from Flooring Xtra why I wanted the information, and she was almost as happy as I was to have cracked the case. Sometimes picking up a phone, thinking outside the box, and acting on a hunch can do wonders when researching!